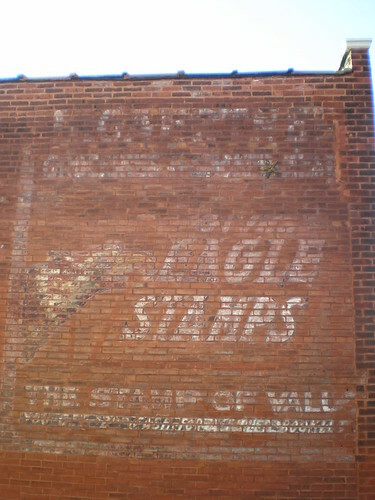 After seeing references to Eagle Stamps on ghost signs around town, I became curious as to what they were. Yahoo Answers helped a little bit. I also found a site with a short history of these types of stamps. Trading stamps got their start in department stores at the end of the 19th century, which owned the stamp plans they used. Schuster’s Department Store in Milwaukee is usually credited with being the first. Other chains with stamps included May (May Co. in Cleveland and its Famous Barr chain in St. Louis–which used them for decades until the early/mid-80s; […] May’s Eagle stamps were one of the few proprietary stamp plans to spread beyond a dept store—it was estimated that 90% of households in the Cleveland area saved them during the 60s & 70s–they also were given by Pick-n-Pay super markets, the Leader Drug coop and numerous gas stations and dry cleaners. Unfortunately these references refer mostly to Cleveland’s Eagle Stamps like this wonderful story from a Woman remembering her childhood in Cleveland. Luckily, more wading through Google search results was fruitful. I found ads referencing Eagle Stamps from Salt Lake City in the Deseret News, to St. Louis circa 1904. I finally found a good written account of Eagle Stamps in St. Louis in an interview of Sam Bellamy, a longtime resident of Dogtown. Sam’s father first had a “filling station” at the wedge of Wise and Clayton, and he was one of the first merchants to give Eagle Stamps. For those of you too young to know, a buyer was given Eagle Stamps as a percentage of the purchase. For a $1.00 purchase you might get one eagle stamp, I can’t recall the rate, it might have been one for each dime spent. There were small books and you accumulated eagle stamps. Then there was a catalog and catalog store where you could redeem your stamps for goods. One of the things the nearly every kid did was to cadge eagle stamps from the adults, easier to get out of them than money. The Eagle Stamp Company knew this and had lots of kids good in their catalog. Last night, I ate dinner with my parents and asked my Father about Eagle Stamps. He told me that he remembered Famous Barr giving them out and his mother saving them up in books. What an interesting piece of history! Ad explaining that Eagle Stamps are given by Thousands of Stores! Grocery stores used to give them out, too. I remember collecting them in the 70’s to save up for toys. In the early 1970s, I remember watching my Mom paste Eagle Stamps into a book, and when it was full we went to redeem it at an Eagle Stamp store in Grandview Plaza in North County. From all the merchandise available to choose from, my Mom picked a clock. Related: Lots of cigarette brands had coupons in the pack that were saved up to be traded in for merch, as well. About the “Eagle Stamps” of the past, I do remember using little booklets issued by May Co. I think. With each purchase we were given a certain number of Eagle Stamps to place in individual squares in the booklet. That was done with every purchase until the book was filled. Then, when it was full of stamps, we presented the completed book to the clerk for a new purchase and the value of the completed book was applied to the new item purchased. Also, as I recall, the stamps were green in color. My wife just found 2 books of Eagle stamps while going through some “junk”. Are they worth anything? Well, 2 books full of Eagle Stamps were only worth 3 dollars apiece while they were still being used over 20 years ago but they may be worth something today on ebay if you can find someone as crazy as me who is interested in the stuff. If they were books of “Green Stamps” they could still be redeemed online here, but Eagle Stamps are a thing of the past. I have several filled green Eagle Stamp books, several filled Top Value (yellow) books, several filled Mars Gasoline Books, and lots of others. Interested? I just read this post. Did you know that Hub Furniture is still operating? It is at 1901 S. Broadway, near Soulard. Very interesting, that’s great to hear that they’re still around. I’ll add a link to their site right away. How funny, but I just saw a TV ad for Hub Furniture tonight. While cleaning out the basement today I ran across a filled book of Eagle stamps and several more Eagle 50 stamps. It took 3 x50s to fill a page and there were 26 pages in a booklet. It says you could redeem the booklet for $4.50 in cash or $5.00 in merchandise. I remember getting them from Famous-Barr in the 60s and 70s, maybe later even. Cool! If you take a picture or scan a page I wouldn’t mind posting an image of them on here. My mom has a bunch of Eagle Stamp and Top Value stamp books (some filled). Do you think they are worth trying to sell or should we just throw them away? I wrote this article about Eagle Stamps for the Webster-Kirkwood Times the week of Christmas 2003. Susan Lang’s mother stood dumbfounded in her kitchen on Christmas Day, 1978. Lang and her husband had divorced the previous year, and she had custody of their of two sons, ages 3 years and 14 months. Well, for one thing, she could save Eagle Stamps, those verdant Art Deco birds of prey that could be pasted into booklets and redeemed for merchandise or cash. Famous-Barr, Golde’s, National Supermarkets and thousands of other retail establishments gave customers the stamps to thank them for their business. The more business, the more stamps. Lang hoarded her Eagles all year and talked her friends into parting with theirs. She pasted them into books on Sundays, when her sons were with their dad. “By Christmas time, I had enough stamps to buy toys for the boys AND enough to buy a nice present for my parents,” she said. The family gathered at Lang’s parents’ house on Christmas Eve. Before bed, her mother pre-set the table with fine linens and china for the next morning’s family breakfast. Lang later re-set the table with eight elegant four-piece Christmas settings she had bought with books of stamps. Another merry Christmas, and another multigenerational tradition that many St. Louisans are too young to remember. Headquartered here from Day 1, the Eagle Stamp Co. was a St. Louis institution for most of the 20th century. Children often bummed the stamps off their parents and used them to buy candy or toys or presents. Trading stamps had been around on the East Coast since the 1890s, but the concept probably didn’t make it to St. Louis until the Eagle flapped its wings for the first time just over a century ago, according to stamp-collector Arthur J. Mongan of Silver Spring, Md. How did they go over? “To see the surging throngs that filed into this store at the opening of the doors — to find at this writing the largest crowd that ever crossed the threshold of Famous, to observe thousands of pleased countenances, each bearing a look of utmost satisfaction, we can arrive at but one conclusion, that these Eagle Trading Stamps have strongly struck the popular chord,” the proprietors announced in print on June 18. Through war and peace, depression and prosperity, families kept saving, pasting and redeeming Plaid Stamps, Top Value Stamps, Green Stamps … and of course, Eagle Stamps. Baby Boomers grew up with the taste of stamp glue in their mouths. “People were given trading stamps for almost everything they bought,” commented author Martin Quigley in the “Super Suburbia” chapter of St. Louis, the First 200 Years, published in 1965.
Business cards were circulating that said, “I have something that nine out of 10 women want and say they can’t get enough of. (over).” Affixed to the back of each card was an Eagle Stamp. The late Andrew P. Brennan, who had helped establish E.F. MacDonald Plaid Stamps and Top Value Stamps in Dayton, Ohio, in the 1950s, succeeded Eli Strassner in 1962 as chairman and chef executive officer of Eagle Stamp, which had become a division of the St. Louis-based May Department Stores Co. Early on, Brennan moved the company’s offices from a crowded suite in a downtown high-rise to a new headquarters at 3100 Market Street. He also streamlined the operation and switched from the standard “We give Eagle Stamps” neon signs to rear-illuminated panels. The company soared on Brennan’s watch, which coincided with the halcyon days of the trading-stamp industry as a whole. In 1968-69, there were 425 trading stamp companies doing about $900 million a year in business, according to St. Louis Globe-Democrat business reporter Robert Blanchard in a September 1978 article. Unbridled success may have become the industry’s undoing. With an estimated 70 percent of grocery stores and about as many gas stations offering trading stamps as premiums, the stamps were no longer considered a competitive edge. Trading stamps took a licking but somehow kept on sticking. The public just wasn’t ready to give them up. With the exception of 1973-74 (during the oil embargo), the Eagle Stamp Co. continued to outpace its 1969 revenue each year, Blanchard reported in 1978. Around that time, with thousands of retailers issuing Eagle Stamps in 10 states, Eagle was ranked as the third-largest trading-stamp company in the country. For that reason, Eagle Stamps didn’t siphon business away from retailers to redemption centers, Paulson noted. Also, shoppers could also take advantage of sale prices, while catalogs and redemption centers charged full price, he said. A dispenser mounted above the cash register had two dials on it, one for amount of the purchase in dollars, the other for cents. “If someone bought $10.50 worth of groceries, you dialed 10 and 50 cents and it counted out 10 big stamps and five little ones,” she said. Double stamps meant she dialed twice. Inkley remembers one cashier whose career crashed when management observed her giving extra stamps to a friend at the checkout lane. “They caught her, and they fired her,” said Inkley. Similarly, Brennan remembered taking a walk around the company headquarters one day and finding a pile of filled stamp booklets outside a window. He soon discovered that an employee who was supposed to be counting the booklets and then sending them to be burned was actually tossing them out to a friend for re-redemption. In Internet recollections titled “The Great Eagle Stamp Expedition,” Amy Kenneley recalled standing as a child in long lines at the downtown Famous-Barr, waiting to redeem stamps. “Clutched in my predatory fist was my passport to fantasyland: a 30-page stapled newsprint booklet the size of a small hymnal, now stiffened by green Eagle Stamps into a plump ruff, richly crackling,” she mused. “Behind raised counters, perched on high stools, were tired-looking older women, their fingers mechanically counting pages of stamp books. I envied them for their seats as I stood fidgeting in leaky galoshes. The line moved achingly slow. After Coughlin’s children grew up, she decided use her Eagle Stamps on something for herself. “Eagle Stamps have been a way of life in St. Louis for over three generations, and old Eagles never die,” wrote Blanchard, noting that stamp books dating from the early 1900s were commonly found in attics and redeemed as part of estate settlements. He repeated a trading-stamp industry spokesman’s claim that he had seen people take their stamps in a store and forget their change, and that a woman in California had rushed back into her burning house to get her stamps, leaving her jewelry and cats behind. The Eagle landed unceremoniously on Jan. 31, 1989, when the May Department Stores decided to shut down its still-profitable trading-stamp division to concentrate on retail and its real estate holdings. Famous-Barr would continue to redeem booklets for $4.50 in cash or $5 in merchandise for 10 years. Now, the stamps, booklets and memorabilia are collector’s items. And those those fragile old neon signs? They’re commanding top dollar among Internet collectors. Mongan, whose philatelic specialty is non-postage stamps, in 1996 published a catalog titled “Remembering Trading Stamps.” In it, he lists and illustrates 67 varieties of Eagle Stamps that were used through the years, including those issued by the Cleveland-based division, Eagle Discount Stamp. After extensive remodeling old Eagle Stamp headquarters became the studio and offices for KYKY-FM. “I saved Eagle Stamps until they were no longer given out,” said Lang, whose gift of china brought tears to her mother’s eyes a quarter-century ago. “But I’m so thankful they were being given out back then. We have used those dishes every year since that 1978 Christmas breakfast. We have added to them through the years, but the original eight were bought and paid for by me, with my many books of Eagle Stamps. And when my mother is gone, I will use them every year at Christmas with my family. Thank you for the Story! This is exactly what I was looking for! I just read about all the testimonials on Eagle Stamps. Last year while wating in line at the Salvation Army my little girl went through a barrel of free clothes. At the bottom of the barrel was this glass Mason jar full of Eagle Stamps and stubs to redeem. Strangely enough it had a cross stitched lid on it saying ” Do not open til Dec. 25″ I have kept it and the oldest stub is from 1983, what should I do to see if these are worth anything? Thanks I was waitng in li to see f I could get some assistance with her Christmas that I couldnt afford. I remember eagle stamps. We’d get them at grocery stores & gas stations. My grandma would let me paste them in her books for her, which, as a kid, was a thrill! Are the Books worth anything today. And if so where can they be reedmed. I found my fathers old book it’s in excellent condition, I was wondering if it’s worth anything today. I was cleaning out an old desk of my parents and found 16 full Eagle Stamp books. There were also six Top Value stamp books. I have enjoyed reading the stories and history of Eagle Stamp books. Is there a collector out there that would be interested in buying them from me?